Making a herb crust for a rack of lamb is a great way to add texture and flavour to the meat. Crusts are usually made from a mixture of breadcrumbs, herbs and spices. Choose the ingredients according to what will work with the other components of the dish as well as the flavour of the lamb itself. Herbs such as thyme, parsley, tarragon, chervil and oregano work particularly well. Ensure that the meat is room temperature before commencing. When hot, season the lamb with salt and fry until golden brown. Vineet Bhatia uses a spice crust of cumin seeds, cardamom pods, dried chilli, coriander seeds, sesame seeds, breadcrumbs, coriander stalks, basil stalks and butter for his spice-crusted lamb recipe. Matthew Tomkinson uses Dijon mustard, breadcrumbs, parsley and tarragon in his Herb and Dijon-crusted rack of lamb with Nicoise vegetable and gratin potatoes. 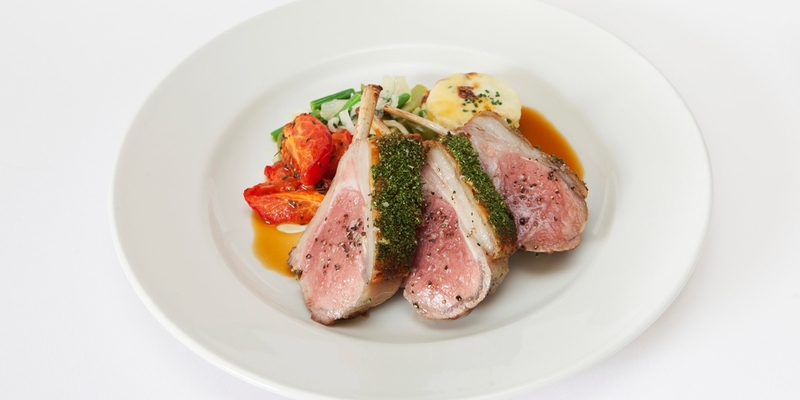 Paul Heathcote uses a similar combination of garlic, thyme, rosemary, parsley and breadcrumbs bound together with egg whites in his lamb dish.